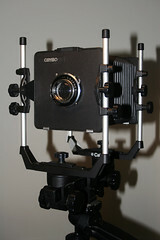 Cambo B. V. Fotografische Industrie is a manufacturer of high quality, mainly large format cameras. It is located in Kampen, the Netherlands, making it one of the very few Dutch camera makers. Roelof Bok started business as a cameramaker in 1945 in Hengelo, in the east of the Netherlands. 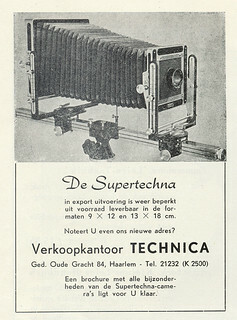 Bok's company was called Technica Hengelo and the first camera produced was the Super Techna. 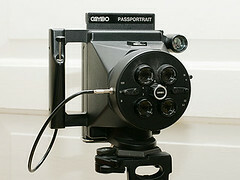 When Bok tried to export his cameras, a possible confusion with the Linhof Technika cameras forced him to rename his products to Favero and later Cambo (i. e. Camera Bok). In 1965 the company moved to Kampen. Nowadays the company sees itself as supplier of architectural Cameras, digital applications, repro solutions, studio stands, shooting tables and other studio accessories as well as a range of portable HDSLR/Video supports. ↑ Bok also designed items for Old Delft, while in business in his own name. With a co-worker, Jan Griffioen, and Old Delft, he registered patents for the mechanism in a film projector to synchronise the film-advance and a rotary shutter; US Patent 3181174, Variable intermittent film advancing means, filed 18 July 1962 and granted 27 April 1965, and equivalent French Patent 1329373, Projecteur cinématographique, filed 20 July 1962 and granted 26 April 1963; archived at Espacenet, the patent search facility of the European Patent Office. Bok also registered patents in his own name alone, for the film-advance mechanism designed for a cine camera using a concave mirror rather than a lens to focus the image: British Patent 810633, Improvements relating to film conveying devices for mirror cameras, filed 5 February 1957 and granted 18 March 1959, and equivalent US Patent 3007382, Film conveying device for a mirror camera, filed 4 February 1957 and granted 6 February 1956. The mechanism must both advance the film intermittently, and operate a pressure pad that forms the film to match the mirror's curved region of focus. The patents do not mak clear what was the application for the camera. ↑ Explorer offered for sale as Ebay item 122117713868, September 2016. This page was last edited on 2 March 2017, at 21:05.